The Asylum Demon was created by the Bed of Chaos and ensures that only the most powerful Undead are able to escape the Northern Undead Asylum. It is first encountered when approaching the graveyard at the Undead Asylum whereupon it jumps down from the roof of the building to attack the player. The Asylum Demon was likely put in place by Gwyn and his descendants to test any Undead who would hope to escape the Asylum. 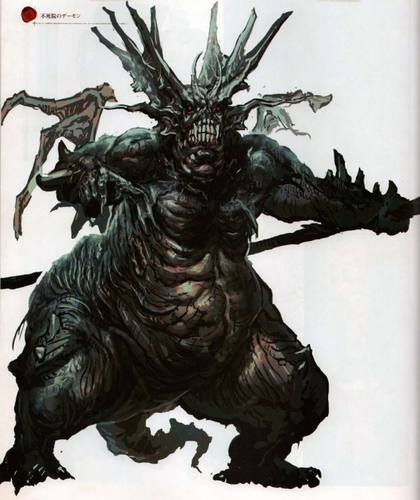 Gwyn and his descendants do not want just any Undead to escape, they want a powerful Undead who would be able to replace Gwyn as fuel for the fire. 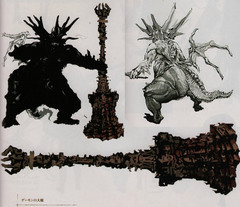 Nakamura: Right from the initial concept stages, when we were still working from key words like "ancient dragon", "chaos demon" and "undead" I thought long and hard about how to create something fresh and new for the people who played Demon's Souls. 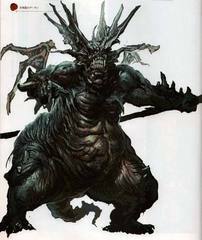 Miyazaki: The demon in the Undead Asylum, the Taurus and Capra demons - in fact, the majority of the demon enemies were designed by Mr. Nakamura. I really love all of his designs, they're simple but not predictable. Exactly the kind of creatures that I imagined populating the Dark Souls world. They're just fantastic. When the Asylum Demon is first encountered, it jumps down from the roof. Oscar is found in a room with a human sized hole in the ceiling, lying upon a pile of bricks, with no other entrance to this room. This clearly indicates that Oscar was smashed through the roof.